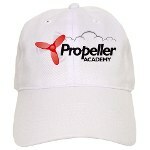 You are here: Home / News / New Propeller Academy Online Store! blankets, yard signs, clocks, mugs, aprons, water bottles, and even a Christmas stocking. The school makes $1 profit from each item.